Pacific Ethanol and Renewable Energy Group ran up last month for very different reasons, but both remain undervalued by the market. What: Shares of the nation's fourth largest ethanol producer, Pacific Ethanol (NASDAQ:PEIX), and the largest U.S. biodiesel producer, Renewable Energy Group (NASDAQ:REGI), turned in solid months last July. The former rode its second-quarter earnings announcement to gains of 25%, while the latter was lifted over 10% higher -- mostly in the last few days of the month -- as a bipartisan political effort to raise biodiesel blending mandates gained steam. So what: Surprisingly, both companies rose despite the fact that global crude oil prices slid for the entire month. That's a testament to the capital-efficient strategies each has deployed in response to a difficult market. Pacific Ethanol enjoyed a massive bounce after it announced second-quarter 2016 earnings. Year-over-year sales grew 86% to $422.9 million, operating income increased from $2.3 million to $11.6 million, and total gallons produced increased 65% to 233 million gallons. Importantly, corn co-products sold -- which boost margins by monetizing waste products -- increased 85% to 1.3 million tons. Investors will want to note that Pacific Ethanol's largest cash expense in the quarter consisted of debt payments. That's the new reality after management pulled the trigger on its Aventine acquisition last year, but if the company can operate profitably in the current below-average market, then investors should be rewarded if ethanol prices trek upward. Meanwhile, Renewable Energy Group's rise coincided with news that a group of 40 senators, led by Sen. Roy Blunt (R-Mo.) and Sen. Patty Murray (D-Wash.), were pushing to increase the federal blending mandate for biodiesel. The argument makes a lot of sense for a simple reason. The amount of renewable fuel that can be legally blended into transportation fuels is set by the U.S. Environmental Protection Agency. But the legally blended benchmark doesn't always match up with the thermodynamic benchmark. Ethanol can only be blended into gasoline at volumes of 10% (to maybe 15%) before the resulting transportation fuel is rendered incompatible with existing infrastructure and engines. Unfortunately, the country's gasoline-based transportation fleet reached its ethanol saturation point long ago, resulting in excess American ethanol production capacity of billions of gallons per year, which is exported or idled. While ethanol blend increases are currently limited by thermodynamics and infrastructure, biodiesel blend increases are currently limited by legal mandates alone. Biomass-based biodiesel can be safely blended into diesel fuel at much higher concentrations -- and we're far away from saturation. The current mandate calls for biodiesel blending volumes of 2 billion gallons and 2.1 billion gallons in 2017 and 2018, respectively, but the senators argue that an additional 400 million gallons of biodiesel could be added to the mandate as early as 2017. If the effort leads to a successful increase in blending mandates, then Renewable Energy Group may be able to restart construction on new production facilities to snag a significant portion of the increased volumes, or simply enjoy higher biodiesel prices and increased regulatory certainty. Now what: Pacific Ethanol continues to prove critics of its Aventine acquisition wrong, but debt payments -- especially upcoming debt payments in 2017 -- could keep a lid on investor excitement in the short term. That's evidenced by the company trading at just 74% of book value despite an impressive 42% year-to-date return. Renewable Energy Group, which trades at just 64% of book value, is also quietly going about its business despite the annual ritual of regulatory uncertainty. Food and Drug Administration-mandated blending volumes are now, for the first time in over five years, set for more than one year into the future (until 2018), but an unexpected increase from political pressure could be icing on the cake. 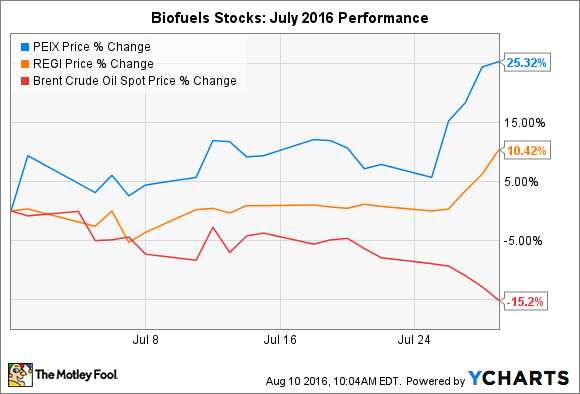 Either way, it appears these biofuels stocks are being neglected by most investors and may be worth a closer look.